PDF Documents can be restricted accordingly by the PDF author and this action will effectively render certain functions to be completely disabled. The restriction can, for example, prevent copying and even printing. I came across a freeware that is able to remove the restrictions few years back, but I don't remember the program. But this time I will not make this useful software slips off my collection, so I better share with you guys. PDF Unlocker is a perfect solution to easily remove PDF document restrictions. The roughly 6MB software needs to be installed first where a shortcut of it will automatically created on your desktop. The restriction removal is very simple; you just need to drag restricted PDF files and drop them on the PDF Unlocker shortcut. New PDF documents without restriction will be created after that and now you have full access on them (print, copy etc). 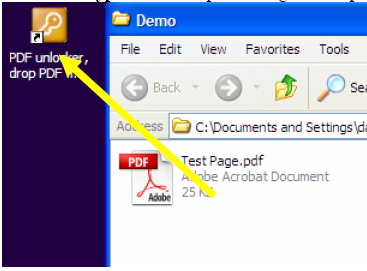 Apart from its main features, PDF Unlocker also allows you to remove "password to open PDF files". There are two types of passwords that can be used in a PDF. 1. A password that restricts some functions. Such as printing, copy & paste. To remove type 1 is as simple as drag and drop the PDF on to the link on your desktop. You can rename the file if you want. this password and any restrictions. Right click Remove PDF Password link and choose edit. Place open password, without quotes.